A food historian does some delicious research. 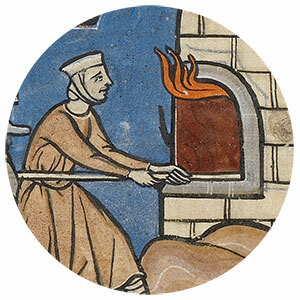 An illuminated manuscript in the Getty’s collection features this illustration of bread baking from the 13th century. For the food historian, it presents a number of quandaries. One figure works the dough with his bare arms in a large trough set on a trestle table, which is clear enough. The other maneuvers a long-handled peel, presumably setting the bread into the oven or removing it. The illuminator had no doubt seen this procedure, but the details are somewhat confusing. On the floor beneath the oven there appears to be a flowing mound of dough of the same type as in the trough, though no one in their right mind would put dough on the ground. It must be a figurative depiction of the rocks or dirt beneath the oven. More perplexing is the shape of the oven, which is extremely tall and narrow—a shape completely inefficient for baking bread, since the heat would rise to the top and the surface of the oven floor would be relatively cool. It would be too small to hold more than a few loaves. Bread ovens are generally more wide at the base than tall, more spherical and domelike. 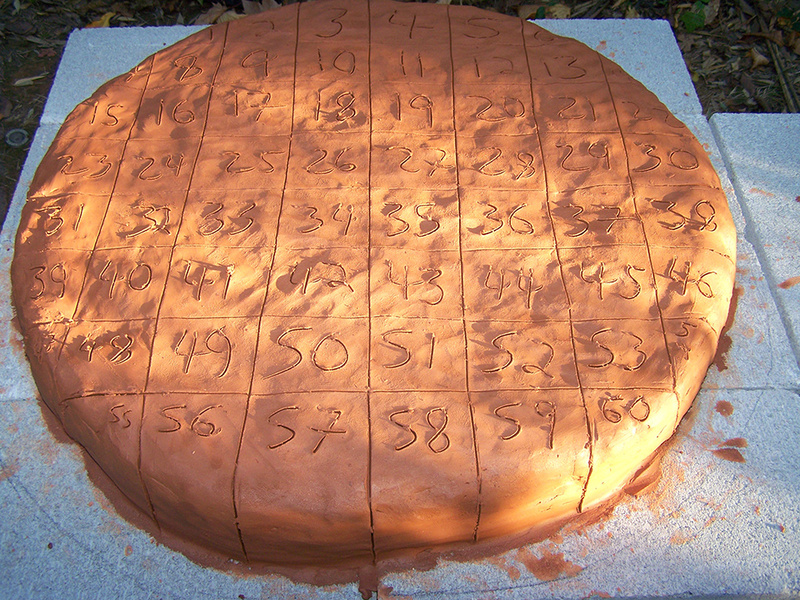 An oven aperture is normally two-thirds the height of the entire oven. This allows for the maximum flow of heat, aiding heat retention. This oven door does seem about two-thirds the height, but again, the oven is much too tall to work properly. Moreover, the flames licking out at the top of the door reflect an early stage of heating, but not the point when the bread would be baking inside. Normally after the hot coals have heated the oven for a few hours, they are raked out and baking begins. 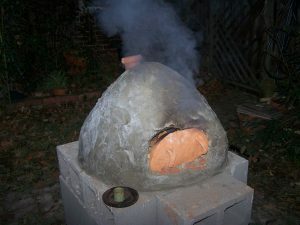 A pizza oven, with which you might be familiar, is a little different as a fire is often kept burning at the rear of the oven to keep the temperature up and pizza bakes very quickly, unlike the slower heat of a bread oven. 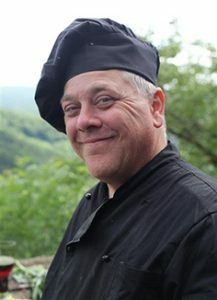 It is of course possible that it is an early kind of pizza or focaccia being baked—without tomatoes, of course, since those didn’t enter European cooking for centuries—but there’s nothing indicating that specifically here. In all likelihood, the artist took some aesthetic liberties with the shape of the oven for dramatic effect or maybe just to fit the illustration neatly into the space on the page. In any case, reconstructing this procedure is largely a matter of guesswork. The earliest recipes for bread appear a few centuries after this illustration was drawn. In England we don’t get a decent description until Gervase Markham’s writings in the 17th century. Take 3 quart of a pound of fine searced flowr: 2 spoonefulls of new barme worke this together wth hotte licore and cover yt close and let it stand and rest one houre & yt wilbe risen enough, then worke yt & breake yt well make small loaves & sett into the hotte oven the space of halfe an hour or lesse. Searcing means finely sifted and bolted flour. To make something close to medieval bread requires completely rethinking the way bread would be made, from beginning to end. I happened to conduct this extended experiment a few years ago as part of a larger research project. 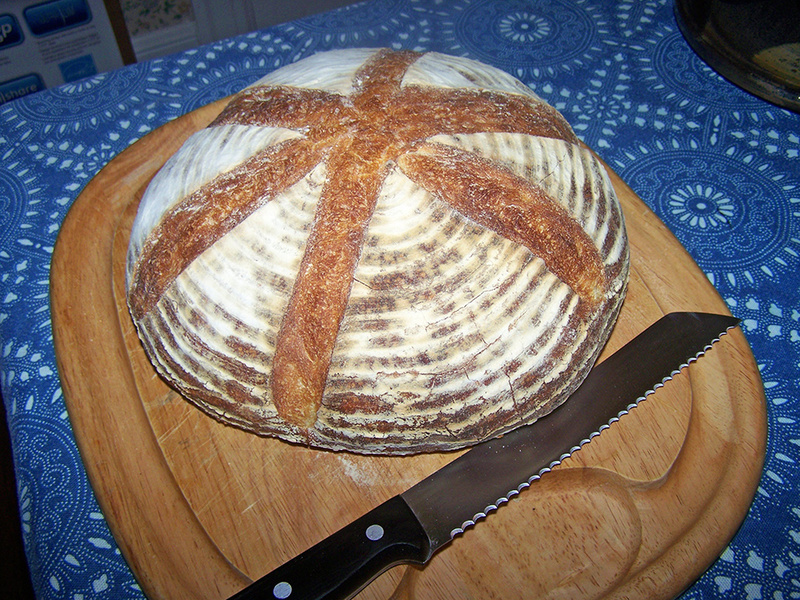 At first I used a natural sourdough leaven, along with commercial flour and a modern oven. It was good bread, but there was hardly anything medieval about it. Commercial flour is a modern, hard high-protein wheat, milled in a completely different way than stone-ground wheat. A gas oven is also entirely different, with a steady even heat. A baking stone with some moisture added into the oven approaches the effect of a wood fired oven, but otherwise reveals very little about the physical experience of baking bread in the middle ages. So here is the experiment from beginning to end. 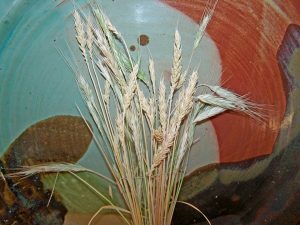 I started by growing a European low-protein wheat with a long historical pedigree. I gathered the seed by hand on a farm in Finland. I then planted the wheat in my backyard in wooden barrels. Predictably there was some rye among it, and what appeared to be a few stalks of oats. No matter, that was probably fairly typical in the past. 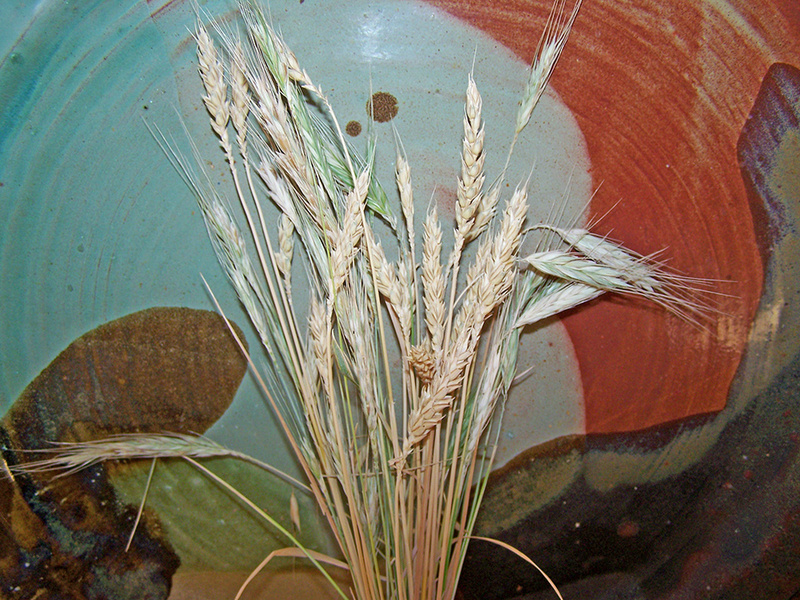 European low-protein wheat from seed harvested in Finland. The wheat grew extremely well in the winter in California and I harvested at best twice the amount of wheat I had planted. Apparently I am not a great farmer, but I was nonetheless able to cut the wheat, thresh, and winnow it in a large basket by hand, more or less as would have been done in the Middle Ages. 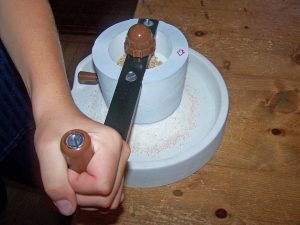 Next came the stone grinding, which was done with a small hand quern. It took about half an hour of milling. A medieval miller would have been much more experienced than I am in “keeping his nose to the grindstone” to prevent heating the grain too much and in separating the hull, but I was able with a few grindings and siftings to get a reasonably fine whole grained flour, a little over a pound or 5 cups. To this was added about a cup of natural starter made only with flour and spring water, fed every day with more flour and spring water for about two weeks until the yeast and bacteria were nicely balanced and it smelled pungent. I had been using it for a month or so to make sure it was strong enough before using on the backyard flour. The starter, flour, more water and a little salt were kneaded into two loaves and each left to rise for about 3 hours, then kneaded again and placed into a wicker basket forms, covered with a cloth and left to rise about 18 hours until nearly tripled in size. Now turn back the clock about a month, when I built the wood-firing oven. I did not follow plans and was determined not to spend a lot of money either. 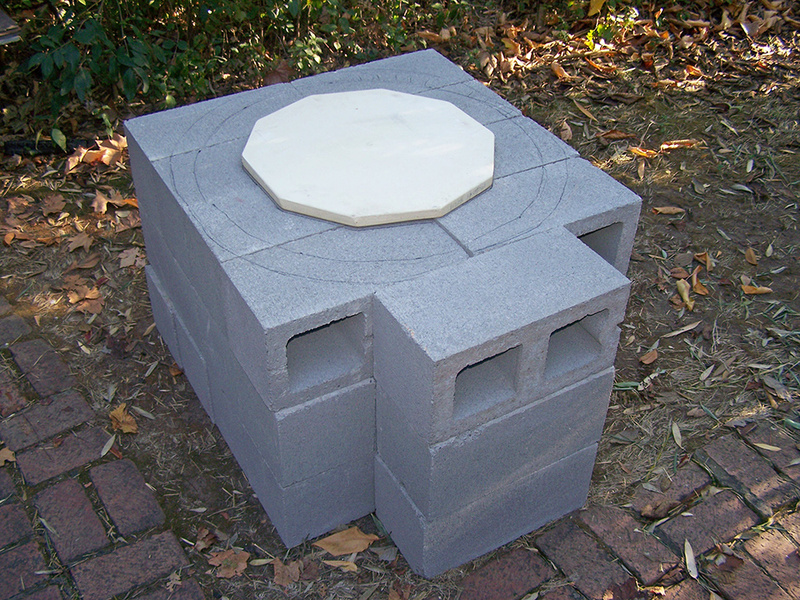 Essentially I laid out cinder blocks on top of which I patted a slab of clay about a foot thick. On top of that I laid a refractory clay shelf, which can withstand direct flame. Then a hemispherical dome of wet sand. On top of that I laid another foot of clay all around. After letting it harden for a few days I scooped out the sand. [LEFT]: The hand-built backyard oven takes shape. 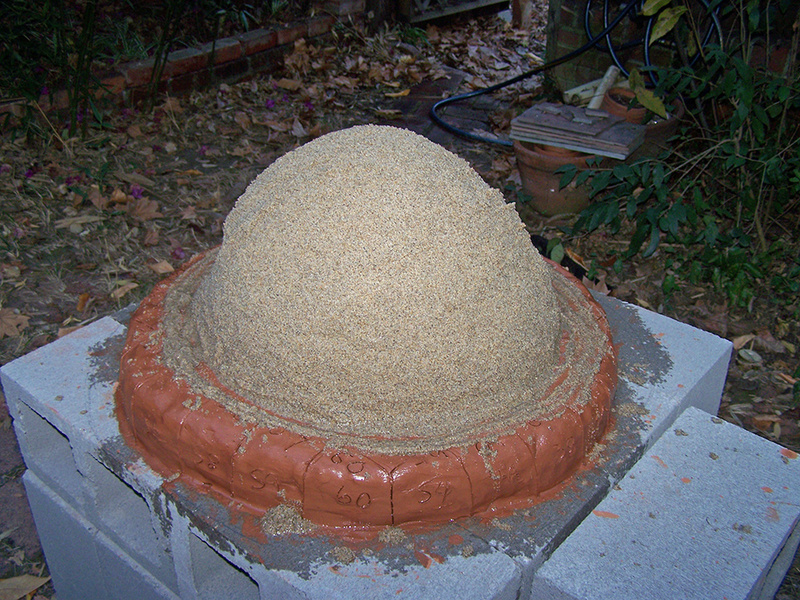 [RIGHT]: A slab of clay and a dome of wet sand atop the oven. 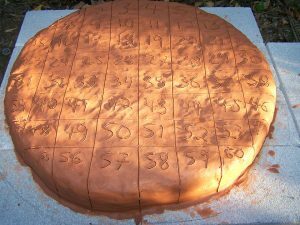 In retrospect, I should have let it dry completely and fired it in situ, but I decided to cut the entire thing into bricks, all carefully labeled and then fired them in a kiln. Little did I realize how hard the reassembly would be when the bricks were labeled with uppercase, lowercase, and Greek letters! [LEFT]: Carefully labeled clay bricks. 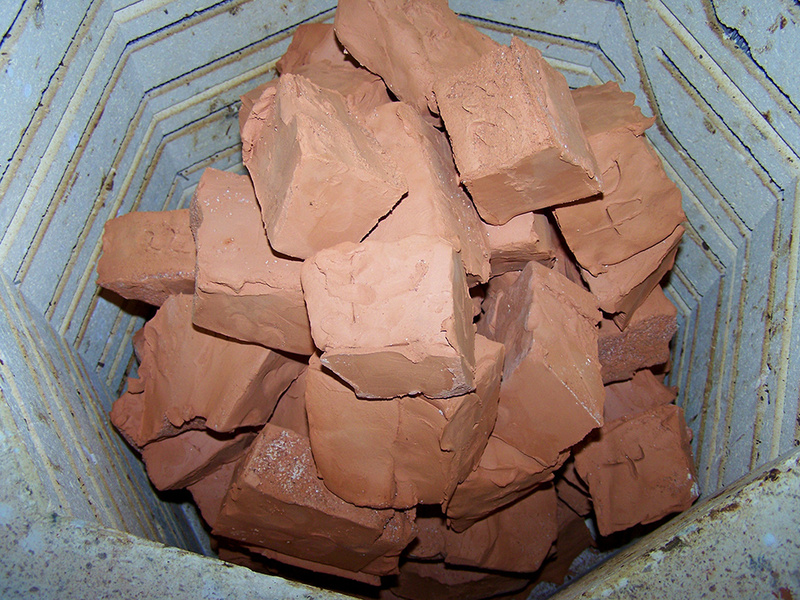 [RIGHT]: The clay bricks within the kiln. I was able to get everything back together with mortar and then cover everything with a foot’s thickness of stucco. Fiberglass insulation would have made it much more efficient at heat retention, as would straw in the bricks, which would have been more historically accurate as well. In any case, the oven worked fine, easily reaching about 500 degrees, which is excellent for baking. Smaller sticks work better than heavy logs for some reason. The oven hard at work. With about an hour or two of burn, the oven was extremely hot inside and could still be touched on the outside, meaning that it did hold the heat fairly well. Once it got hot enough I dragged the ashes out with a shovel and cleaned the floor of the oven with a wet mop. The loaves were turned out onto the peel, quickly slashed with a very sharp knife in a star pattern allowing the dough to rise upward, and finally slid into the oven. The door was closed and the loaves baked until they sounded hollow when rapped. The result you can see in the final image below. Whether this bears any resemblance to a medieval loaf is beside the point; I was able to experience more or less what the medieval baker would have done every day, on a larger scale. And incidentally, the bread was fabulous. 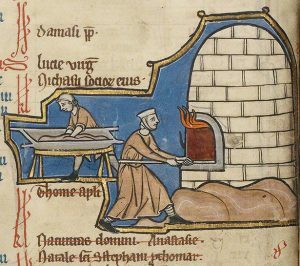 This entry was posted in Food, History, Medieval, Middle Ages. Bookmark the permalink.